DOSTA! GRINTA! ENOUGH! demonstration success. A great day at this historic event which took place in Parliament Square, on Saturday 21st May, was attended by around 200 people. Brilliant speakers, excellent organisation and at the end a petition was presented at 10 Downing Street. The rally was a protest against the new Housing Act which redefines Gypsies and Travellers for the purposes of planning law. 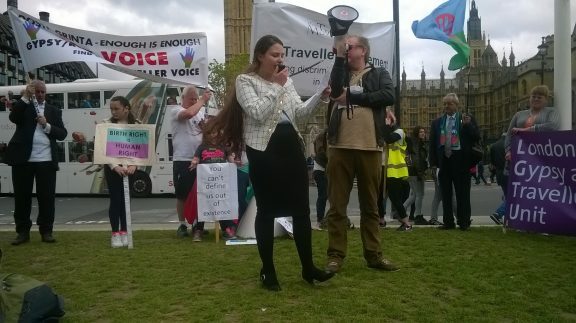 Gypsy and Traveller rights, culture and equality are all under threat. ACERT was well represented by our Chair and other members. A petition was handed in to 10 Downing Street. 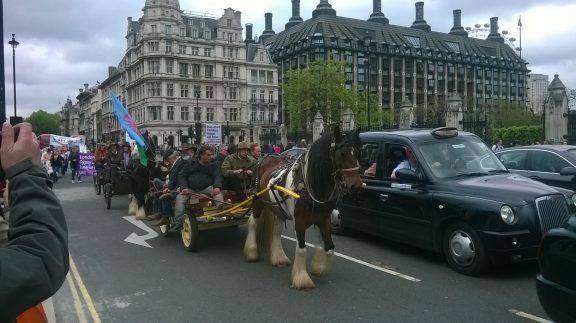 The demonstration was led around Parliament Square three horses and carts.